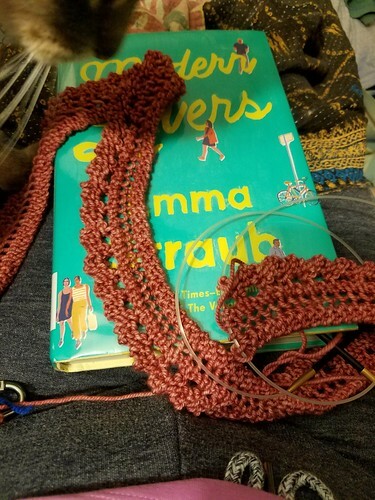 A yellow jersey project requires a certain amount of fortitude (and stitches), and while I yearned to cast on something gorgeous and delicate, like Rock Island, I decided to listen to Rudi’s advice of not making it so complicated I had to become a hermit. While flipping through the stash on the hunt for a different yarn, I turned up three skeins I’d bought years ago to make Andrea’s Shawl. Since that pattern was also already paid for and in my possession, I decided to do a little stash-busting. “A different simple sentence,” he said. “More simple, more said,” she said. “Getting the picture?” he said. An editor should have pared down all of those extraneous “he/she saids,” particularly when it’s just two characters in the scene. As underscored when reading Mansfield Park earlier this year, not having enough attribution in dialogue can be confusing, but it doesn’t need to be every single line. If I weren’t enjoying it otherwise, I’d throw in the towel just for that reason (or switch to print, where, as I said, I might not have noticed it as much), because it keeps making me grit my teeth. But I am, so I’ll finish it off this week. I’m only a few more pages into Modern Lovers than I was last week (having finished and started two different books in the meantime). Category: books,knitting. There is/are 5 Comments. Beautiful knitting, and there is certainly something to be said about knitting the long rows first, decreasing to the finish! I requested “Modern Lovers” from my library, but there are over 100 people ahead of me in line for that one, so it will be a while. But the library was kind enough to find me a copy of “Gold Fame Citrus” by Claire Vaye Watkins, so I will start reading that soon. Currently I am reading Shannon Hale’s “Austenland,” which I had a sudden desire to read. Perhaps I was still yearning for something Austenish after the disappointment that was “Mansfield Park.” So far it’s pretty good, definitely better than the movie, but I really wish that I hadn’t already seen the movie. I don’t know if it’s always a mistake to see a movie before you read the book it was based on. I so rarely do that. But I’m certain in this case that my dislike of the movie is affecting my reading. @AsKatKnits: Yes! I’m excited to do it that way. Usually there’s some terrible number of stitches to bind off. @Karen: I’m on a couple hold lists like that. I admit that I could tell from the commercials that the Austenland film was going to be different enough from the book, which I enjoyed, that I’d be hard-pressed to watch it. I’d been contemplating it again recently, so I’m glad you vetoed it on my behalf. I’m not usually a fan of dystopians, but if you think I’ll enjoy Gold Fame Citrus, let me know and I’ll check it out.